Staying a breast of these fast markets in the cannabis space is very challenging and time consuming. 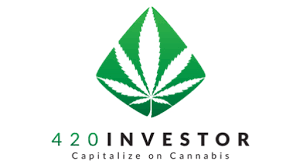 We suggest you also take a subscription with Alan Brochstein, at 420Investor.com. Alan is literally the ‘boots on the ground’ in the cannabis space. Highly respected and in touch with the management of companies he recommends. With Canada set to make history this week by tabling legislation to make the nation the first G-7 country to legalize cannabis for adult use, many investors are focusing on the market. 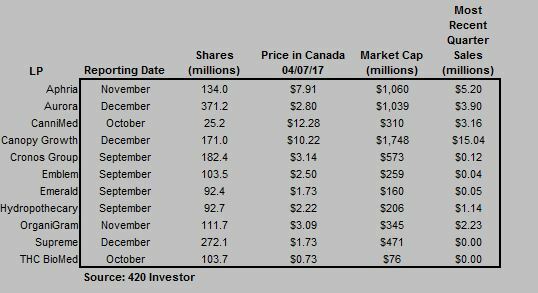 33 companies hold 41 licenses issued by Health Canada under ACMPR to cultivate or sell cannabis, and 11 of these trade publicly on either the CSE, the TSX Venture or the TSX, with several others prepared to begin trading this month. Each of these stocks can be bought by anyone who has an account that permits the purchase of Canadian securities. For U.S. investors, 8 of the 11 stocks are actually traded on the OTC, with the other three having unsponsored ADR trading tickers. In all cases, several brokers will allow U.S. investors to trade the U.S. equivalents, meaning that one can invest in the sector without actually having an account that permits non-U.S. stocks. Investors should be aware that not all brokers will permit their customers to trade cannabis stocks, and some require that orders be called in rather than executed electronically. 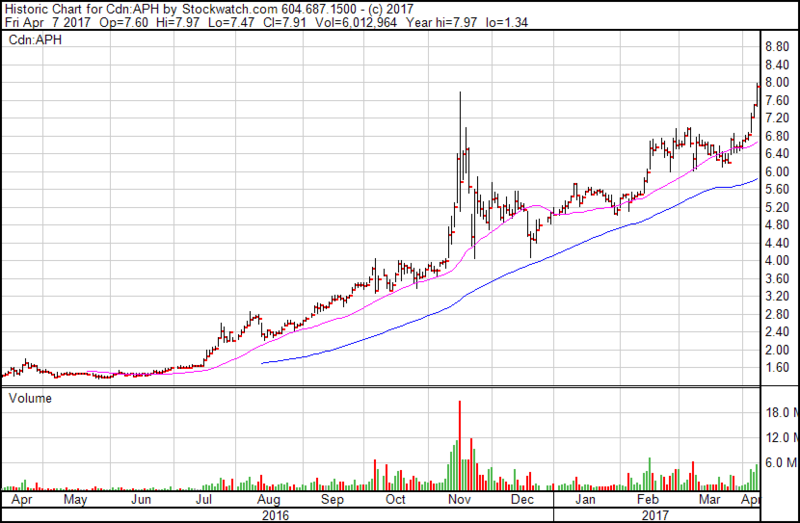 Reviewing the 11 publicly-traded stocks alphabetically, the first is Aphria (TSX: APH) (OTC: APHQF), which is focused exclusively on greenhouse production. This is one of the three LPs with a market cap in excess of $1 billion. The company has also invested in MMJ companies in Arizona and Florida. 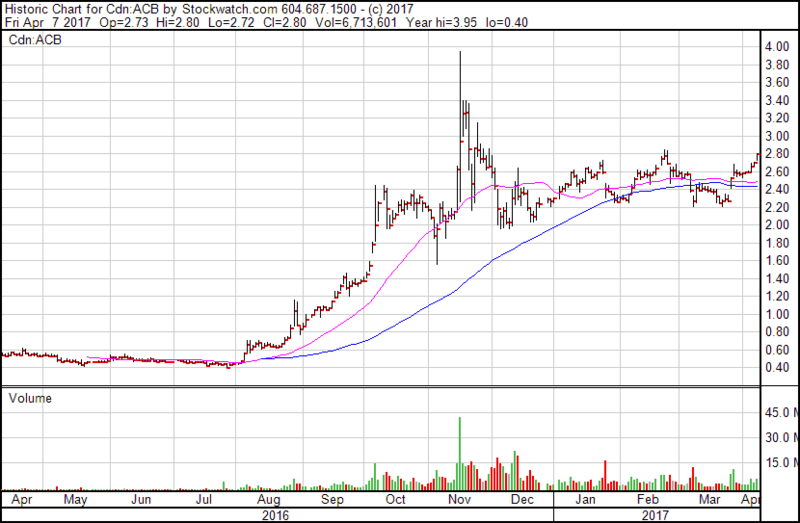 Aurora Cannabis (TSXV: ACB) (OTC: ACBFFF) is also one of the three LPs with a market cap in excess of $1 billion. The company has an an indoor production facility in Alberta, where it offers same-day delivery, and is building a massive hybrid production facility there as well. It recently acquired a late-stage ACMPR applicant in Quebec. 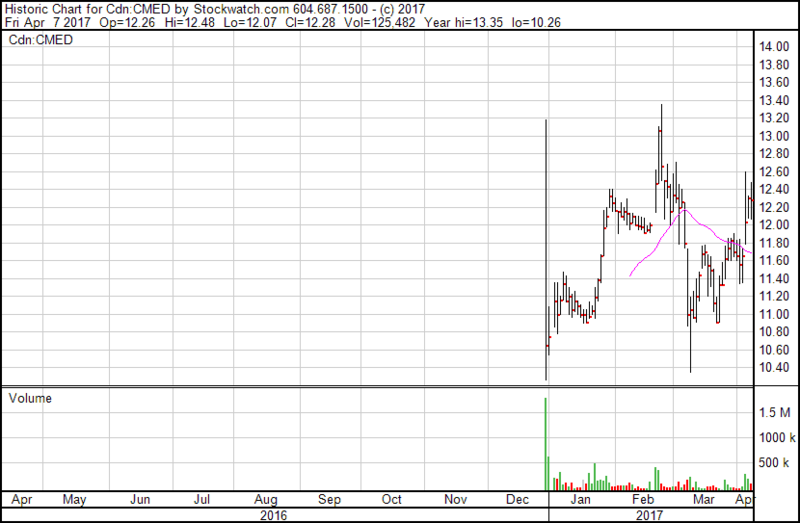 CanniMed Therapeutics (TSX: CMED) (OTC: CMMDF) began trading publicly in late 2016 under a true IPO at $12 per share and previously held the sole commercial production license in Canada under the prior MMAR regime. 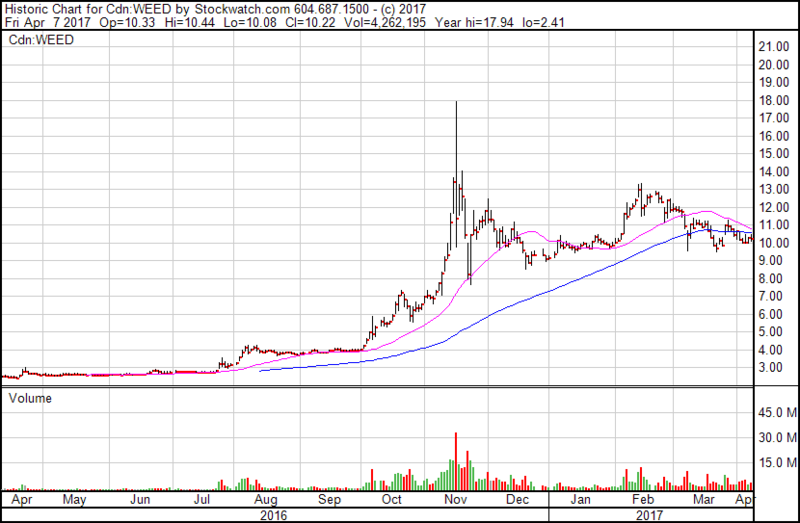 Canopy Growth (TSX: WEED) (OTC: TWMJF) is the leader in the industry in terms of sales and market cap. The company began as Tweed and acquired Bedrocan Canada and Mettrum and also has stakes in a Quebec-based applicant and anther based in Saskatchewan. The company, which currently operates 4 indoor facilities in Ontario as well as a large greenhouse, has exposure to Germany, Australia and South America. 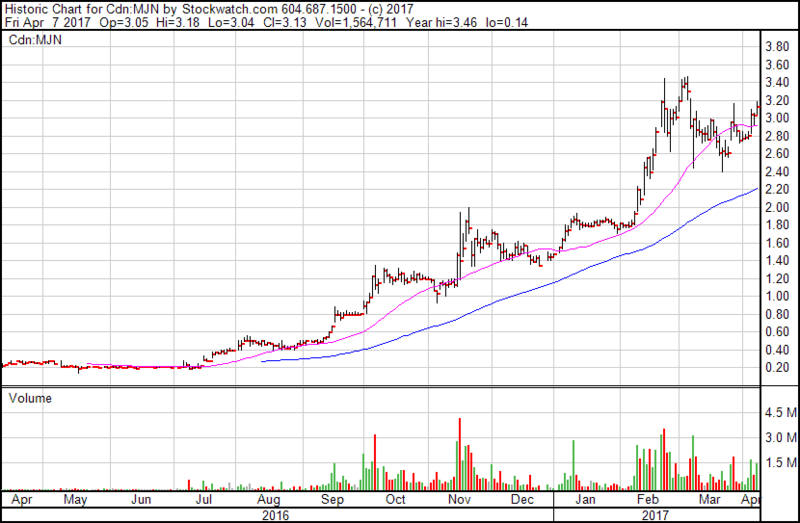 Cronos Group (TSXV: MJN) (OTC: PRMCF), formerly PharmaCan, owns In the Zone and Peace Naturals and has stakes in several other LPs. Its Peace Naturals subsidiary is exporting to Germany. 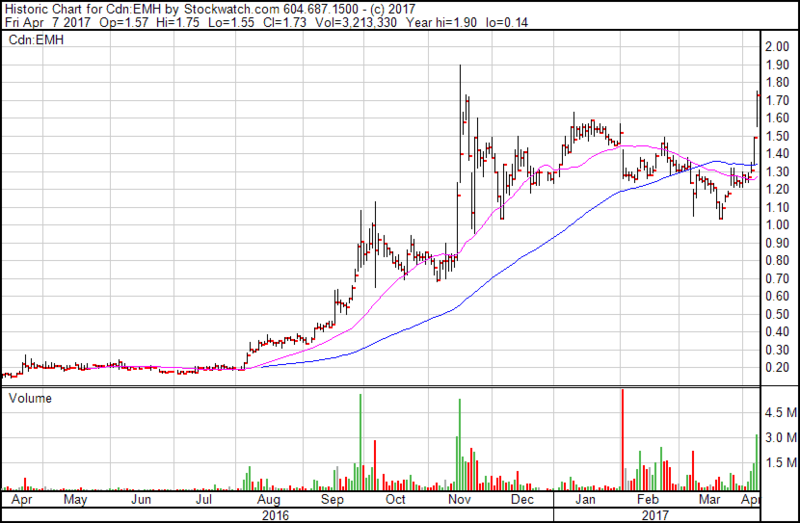 Emblem Cannabis (TSXV: EMC) (OTC: EMMBF) began trading in December. The company, which also owns the GrowWise clinics, has a management team with deep pharmaceutical experience. CEO John Stewart formerly headed Purdue Pharmaceuticals. 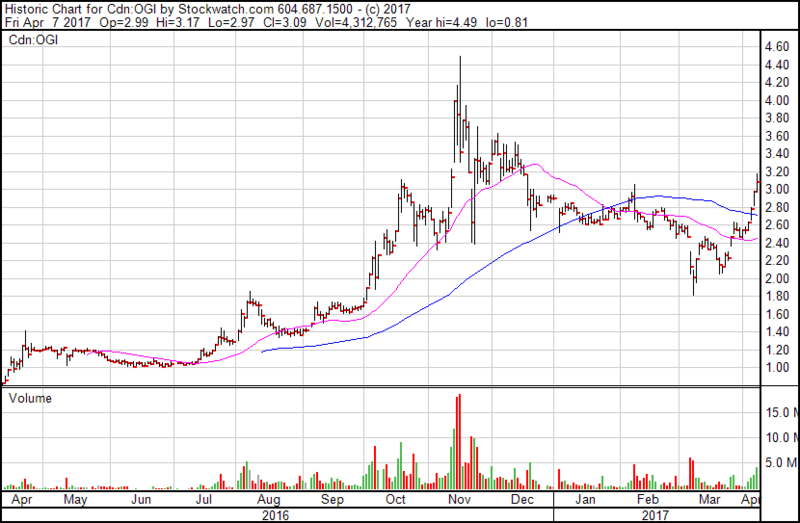 Emerald Health (TSXV: EMH) (OTC: TBQBF), one of the early license recipients, also has a medical approach. The company is currently constructing a second facility in Vancouver that will permit scale production. Hydropothecary (TSXV: THCX) (OTC: HYYDF) just began trading in March. The Quebec-based greenhouse grower entered the market with a super-premium offering and recently introduced lower-priced products. Organigram (TSXV: OGI) (OTC: OGRMF), based in New Brunswick, is one of the only Maritimes-based LPs. The company went through a voluntary recall due to a pesticide issue. 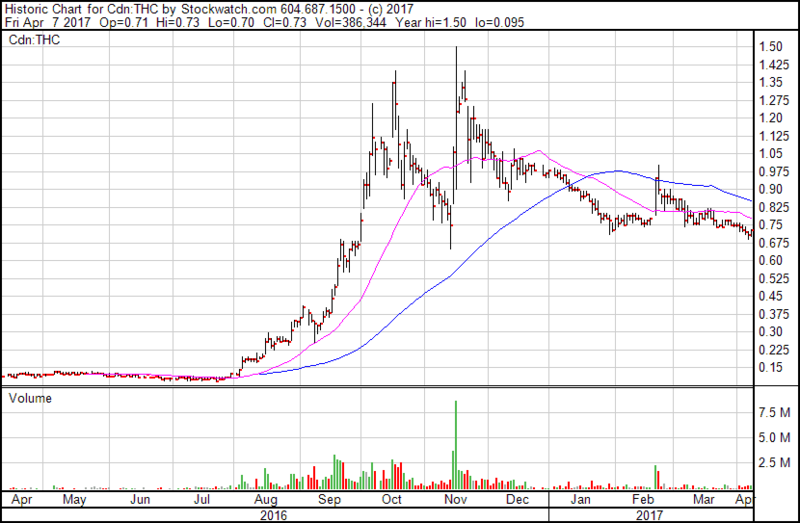 Supreme Pharma (CSE: SL) (OTC: SPRWF) holds the license for 7 Acres, a large hybrid greenhouse in Ontario. The company, which isn’t yet permitted to sell, is focused on serving the B2B market exclusively. 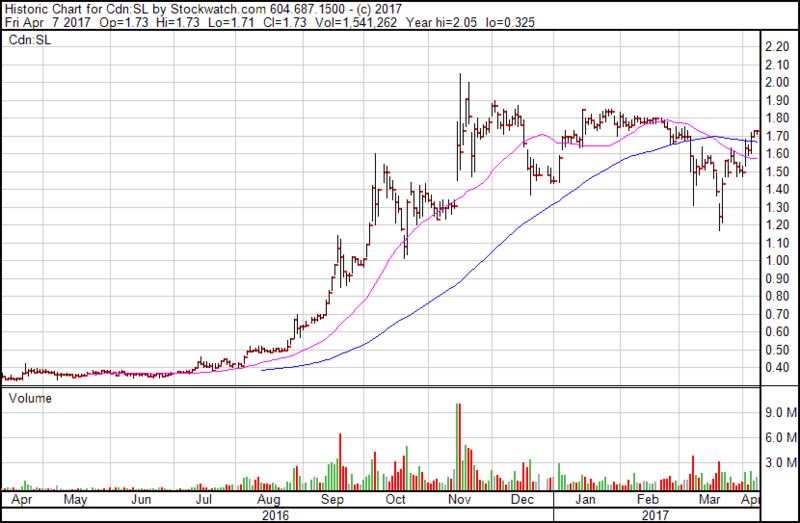 THC BioMed (CSE: THC) (OTC: THCBF) has been one of the only LPs unable to raise capital thus far and has the lowest market cap among all of the publicly-traded LPs. The list of options is about to expand. 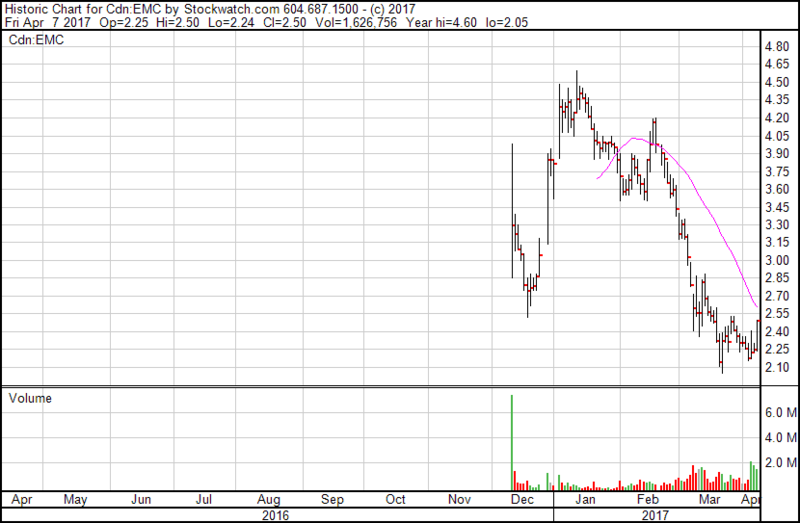 Invictus Health (TSXV: IMH) (OTC: IVITF) owns 1/3 of A B Labs and has an option to acquire Acreage Pharms. Three stocks that are expected to begin trading in April are ABcann Medicinals (TSXV: ABCN), Harvest One (TSXV: HVST), the parent of United Greeneries, and WeedMD. Companies expected to begin trading later this year are CannTrust, MariCann and The Green Organic Dutchman. An alternative to investing in individual LPs is the new Horizon Medical Marijuana Life Sciences ETF (TSX: HMMJ), which began trading on April 5th. Investors may like the ease and convenience of taking a diversified stake in a single investment, but they should be aware of some of the short-comings, including a management fee of 0.75%, limited diversification and the inclusion of several stocks that appear to be a stretch. The fund began at $10mm but had reached $37mm by April 7th. 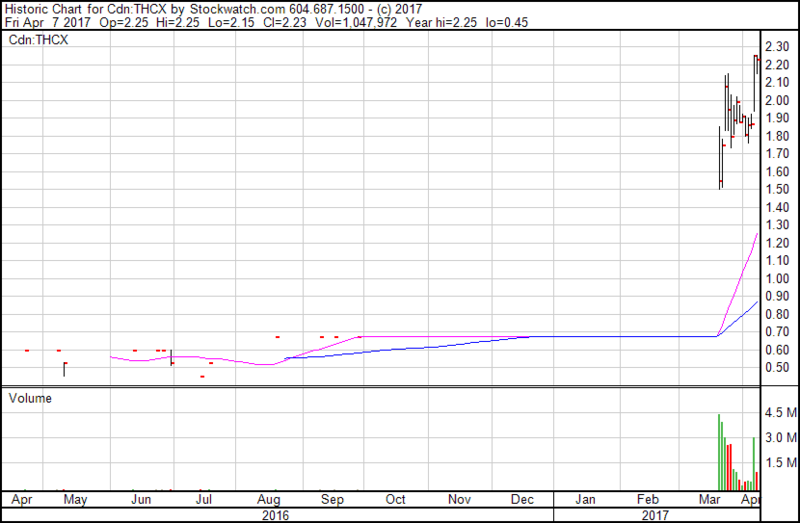 The ETF includes 9 of the publicly-traded stocks (excludes Hydropothecary and THC Biomed) and 7 non-LP stocks. Finally, while the public market is accessible to everyone, accredited investors and to a lesser extent non-accredited investors have been able to generate high returns from investing in the private placements of companies prior to their becoming publicly-traded. For those that are interested, they can contact the companies mentioned above that aren’t yet public or can reach out to the other private companies. Establishing a relationship with some of the brokers covering the space, like Beacon Securities, Canaccord Genuity, Eight Capital, GMP Securities or PI Financial could help identify opportunities as well. There are many options to participate in the Canadian cannabis industry, with more becoming available over the balance of 2017. New Cannabis Ventures has been offering extensive coverage of the LPs since it launched in 2015. To learn more about the sector, please refer to our resource page.